One of the best – and easiest – times to make memories is in that wonderful space of time between Halloween and New Year’s Day. There are so many fun events and an awe-inspiring flood of lights to set the perfect backdrop for family gatherings, romantic walks, and joy-filled Santa visits. 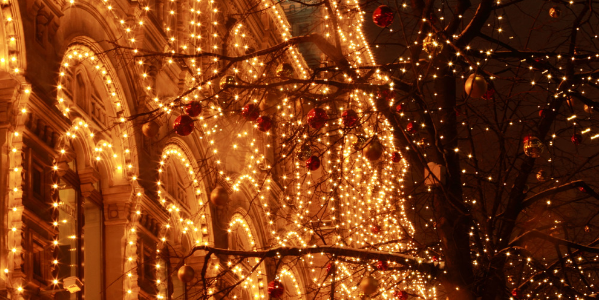 Make the most of this holiday season with these 15 memorable holiday events around Denver! A Hudson Christmas: Take a festive stroll through the gardens that are transformed into a beautiful wonder of light. Visit Santa, warm up in the Yuletide yurts, and sip delicious cider or hot chocolate. Located at The Hudson Gardens at 6115 South Santa Fe Drive in Littleton, the lights are glowing from 5-8 pm. Ticket prices start at $8, and advanced purchase is recommended. 2. Blossom of Lights: The annual extravaganza of lights is an event not to miss! Enjoy an interactive light display, which features a large field of sound-reactive, animated LED lights. There are also refreshments and souvenirs for purchase. Located at the Botanic Garden at 1007 York Street in Denver, tickets start at $13 and are available only online. Advanced purchase is highly recommended. 3. Breakfast at The Brown Palace with Mr. and Mrs. Claus: Every Saturday in December you can enjoy music, entertainment, and breakfast with Santa and Mrs. Claus at the Brown Palace Hotel, 321 17th Street in Denver. Reservations are required. 4. Chanukah Night at the Children’s Museum: December 8th from 6:15-9pm, enjoy a Chanukah festival with latkes, crafts, dinner, and the great dreidel hunt! $15 per person or $72 family rate for early birds. 5. Colorado Symphony Orchestra Special Events: There certainly isn’t a shortage of options when it comes to celebrating the holidays in the symphony! Get tickets to one or immerse yourself in all of them: Home Alone in Concert, Ingrid Michaelson Trio Songs for the Season, A Classical Christmas Conducted By Brett Mitchell, Ten Tenors–Home for the Holidays, Celtic Woman–Best of Christmas Tour, Holiday Brass, Too Hot to Handel, and A Colorado Christmas! 6. Denver Center for Performing Arts Holiday Shows: There is a little something for every Christmas lover this holiday season at the Denver Center for Performing Arts! A Christmas Carol, Irving Berlin’s White Christmas, and The SantaLand Diaries will all grace the stage through December 24th. (A White Christmas ends on December 15th). 7. Denver Christkindl Mart: Enjoy delicious cuisine, handmade jewelry, toys, clothing, gifts, and festive German drinks in this celebration of German and European holiday traditions. Each evening offers live entertainment in the festival tent. The Christkindl mart runs through the 23rd of December and is free to attend, but bring plenty of spending money to finish off your holiday gift lists! Located at 1515 Arapahoe St., Denver, CO 80202. 8. Elf the Musical: The Arvada Center for arts and humanities brings the Christmas tale alive to help you celebrate the real reason for the season and to truly get in the holiday spirit. The play runs through December 23rd. Purchase your tickets early to make sure the show you want doesn’t sell out! Tickets start at $53, and the Arvada Center is located at 6901 Wadsworth Blvd., Arvada, CO 80003. 9. Georgetown Christmas Market and Events: Hot roasted chestnuts, Saint Nicholas, European arts and crafts, music and entertainment – all put together makes the perfect Christmas experience on 6th street in Georgetown. Admission is free to this 58th annual holiday experience and is held the first and second weekends of December. 10. Ice Skating with Santa at Skyline Park: Join Santa for special skating sessions on December 9th, 16th, and 23rd from 1:30-3:30pm! Skating is free. Skate rental starts at $6. 11. Parade of Lights: The 43rd annual 9News Denver Parade of Lights will be marching through Downtown Denver on November 30th and December 1st! It is free to attend, but spots are first-come, first-served. 12. Santa’s Village at Chatfield Farms: Chatfield Farms gets transferred into a magical Christmas village complete with Santa’s live deer, crafts with Mrs. Claus, holiday lights, hayrides, a movie on Elf Boulevard, and a complete Santa’s workshop with craft vendors. You can buy tickets on location if available, but to ensure availability, purchase online in advance. Ticket prices start at $20. It is located at 8500 W. Deer Creek Canyon Road, Littleton, CO 80128. 13. Shabbat Festival of Lights: The JEWISHcolorado Young Adult Department is hosting this festive evening, complete with dinner, an open bar, and entry into the Botanic Gardens Blossoms of Lights! There is an optional Kabbalat Shabbat at 5:45pm. The event is from 6-9pm on December 8th. 14. The Nutcracker Ballet: Ellie Caulkins Opera House welcomes its 58th year with the beloved story of Clara and her Nutcracker, and the magical journey they take on Christmas Eve. Tickets sell out fast so get yours early! 15. Zoo Lights: The zoo is celebrating its 28th year for this popular holiday tradition! Experience the Denver Zoo in a completely different way as you walk through festive lights, visit Santa, and enjoy hot chocolate. Tickets sell out fast. Please be sure to check venue websites for locations and times, updated ticket prices, to purchase tickets, and for terms and conditions. Please note that many of these events sell out in advance.